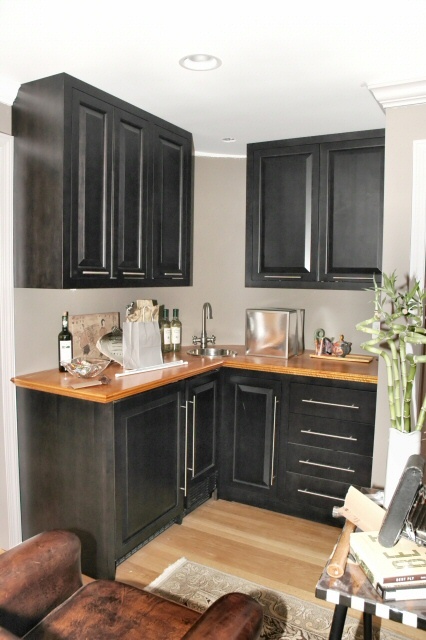 This is a stained Maple kitchen done in a European cabinet style. 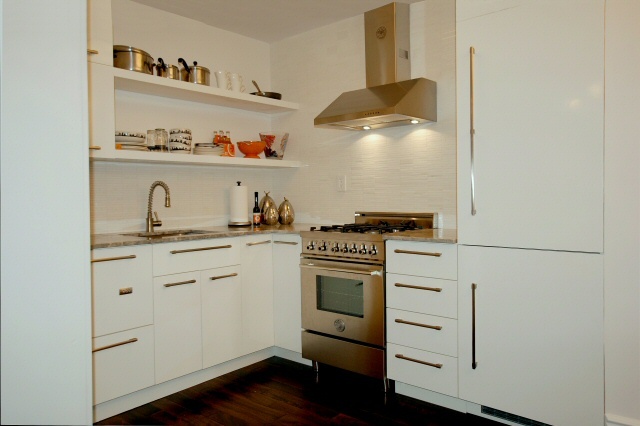 The doors, drawer fronts and cabinet sides have a recessed panel with a raised molding. The doors swing on European concealed hinges and the dovetailed drawers ride on undermount self closing slides. The pantry cabinet has roll out shelving on the lower section and adjustable shelving on the upper section. 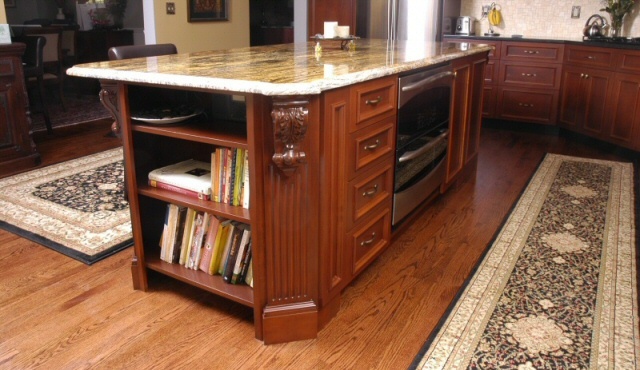 The island has a bookcase for those cookbook that are necessary for any kitchen. It is surrounded by fluted pilasters with plinth blocks and Acanthus leaf corbels. 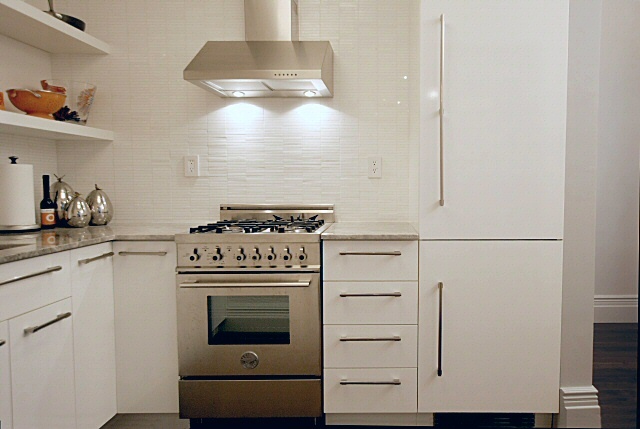 The stove is vented by a hood with a detailed wood surround. 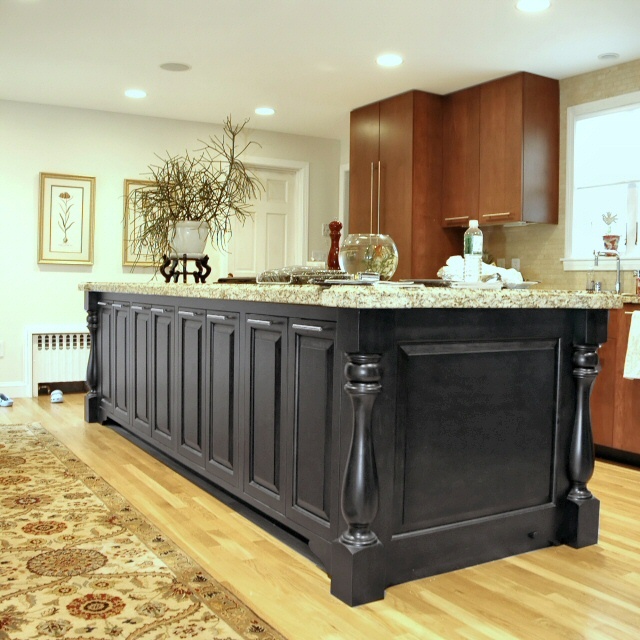 The surround also has fluted pilasters and a raised applique to be one of the center pieces of the kitchen. The hutch at the end of the run sports 3 large drawers and a lighted display area with beautiful applied lead glass. 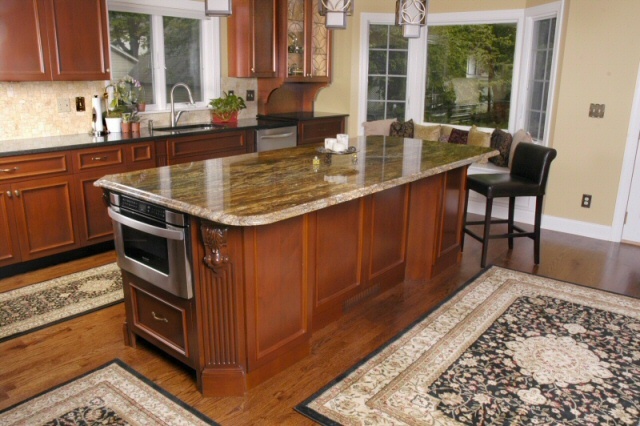 The pattern of the glass in the hutch matches the hanging pendants over the island. 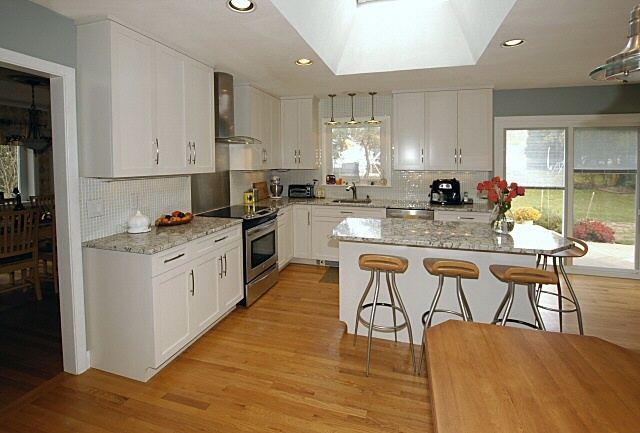 This kitchen resides in West Hartford, CT. 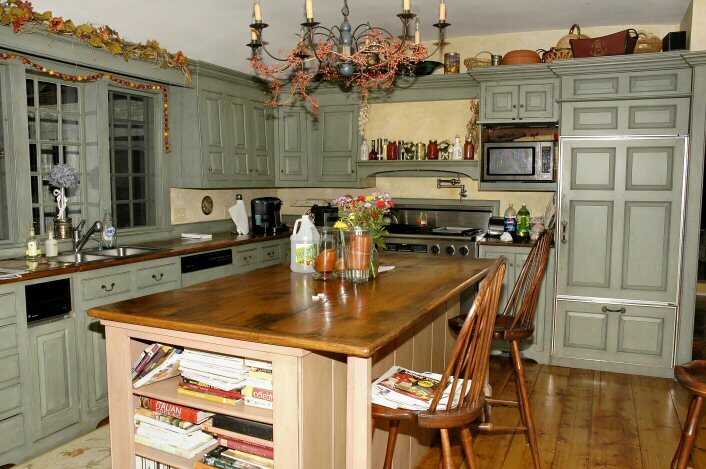 This is a kitchen done in the 18th Century style. 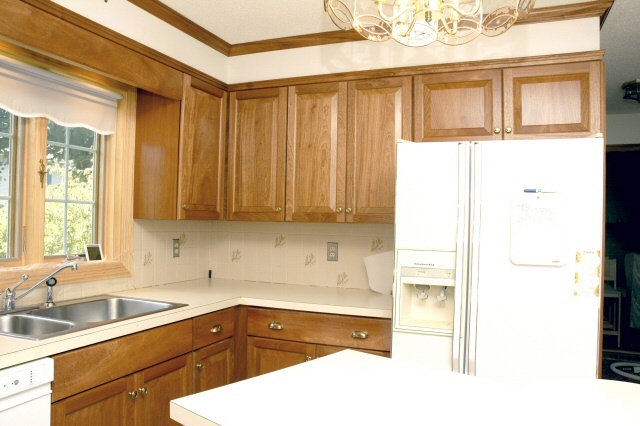 The upper cabinets are slant fronts, notice that they slant back. This was taken from the ships that would travel the high seas. 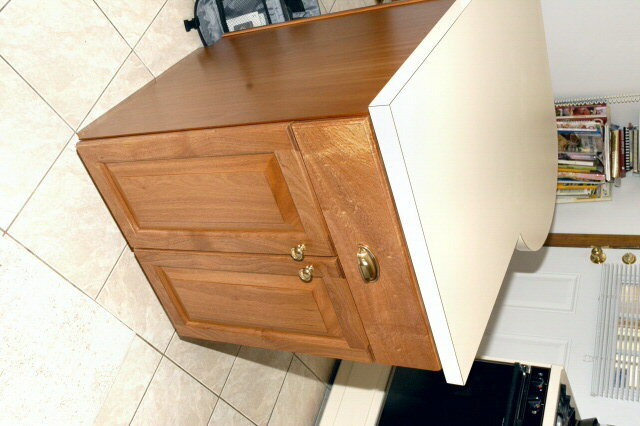 The cabinets would cause the doors to stay closed. The doors and have raised panels and the door opening are surrounded by decorative beads. The drawer fronts have the beads carved into the fronts themselves. 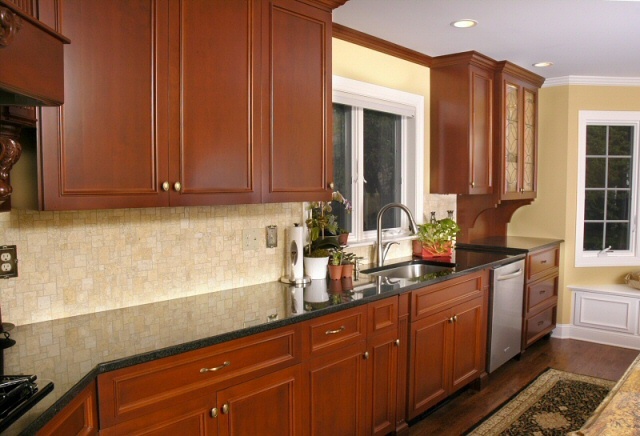 The paint is a multi layered rub through to make the furniture grade cabinets look older. 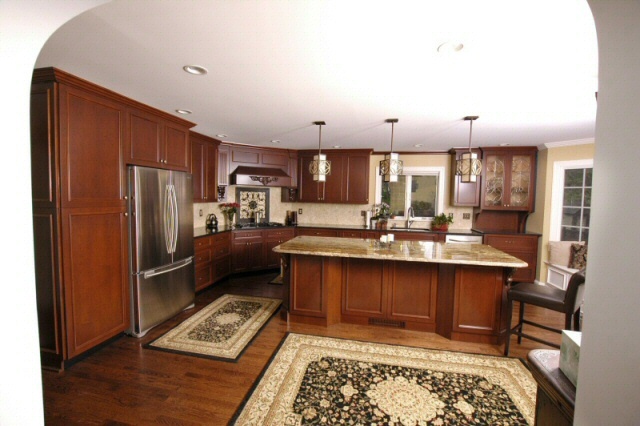 This kitchen resides in Canton, CT. 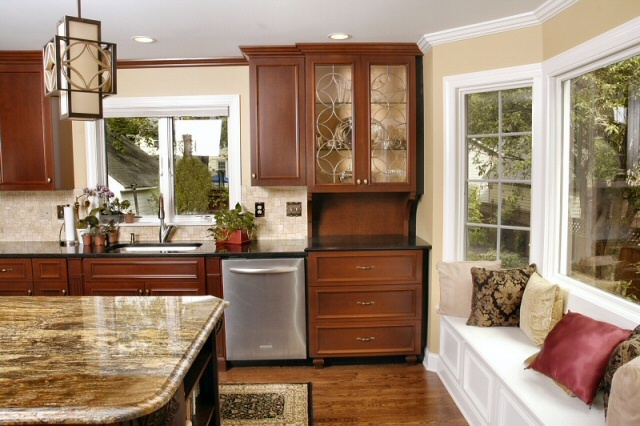 This is a kitchen reface. 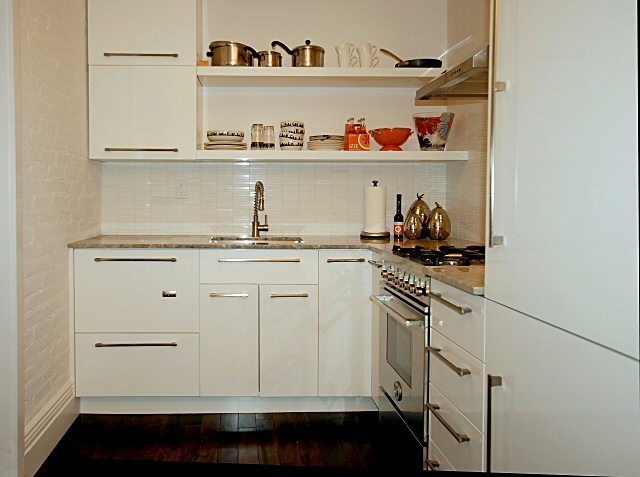 The original kitchen was of 50's styling with plain stained plywood doors and black hardware and semi concealed hinges. 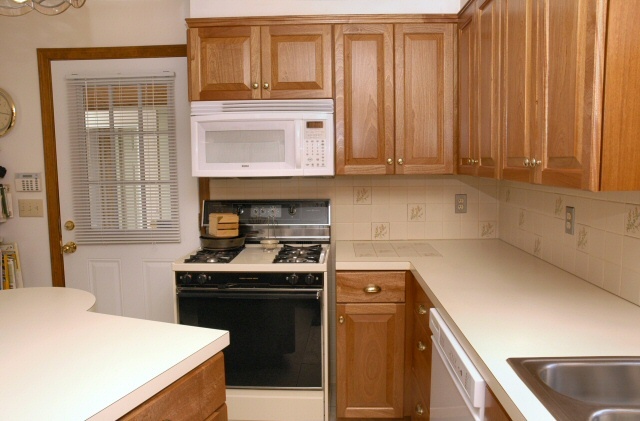 The kitchen was redone with raised panel Sapelle' doors with a clearcoat. They were hung on European concealed hinges with full overlays to hide the faceframes below them. 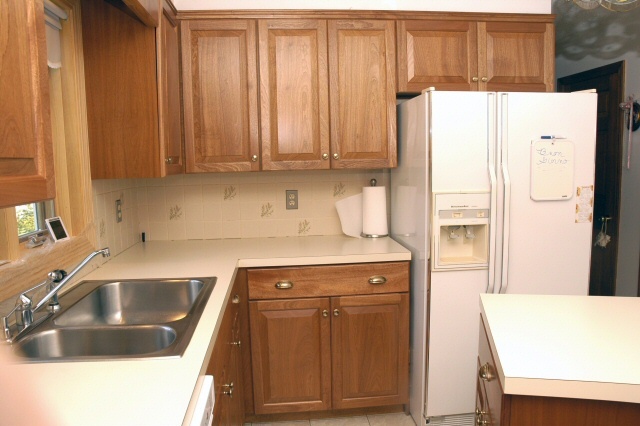 The exposed sides of the cabinets were covered with either a raised panel or a flat panel. 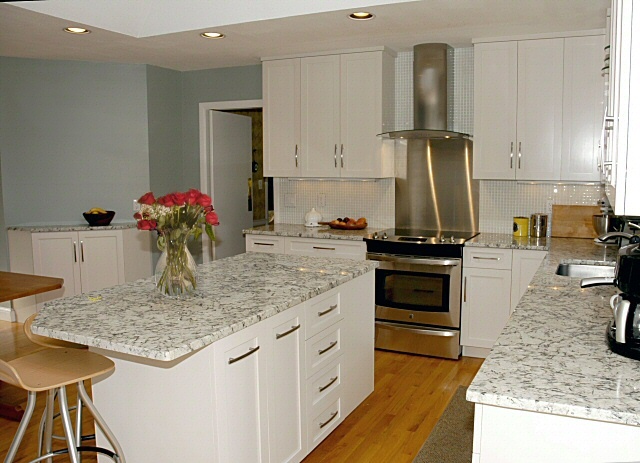 The drawers were replaced with solid maple dovetailed drawer boxes and the hardware was replaced with a soft closing undermount slide. 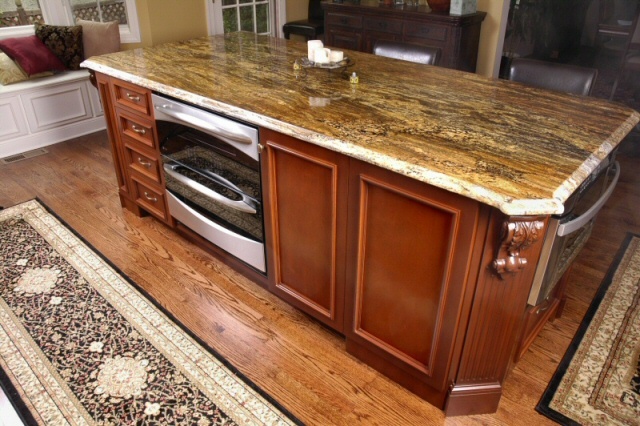 The drawer fronts were slab design with a decorative edge routed on, the same as the doors. 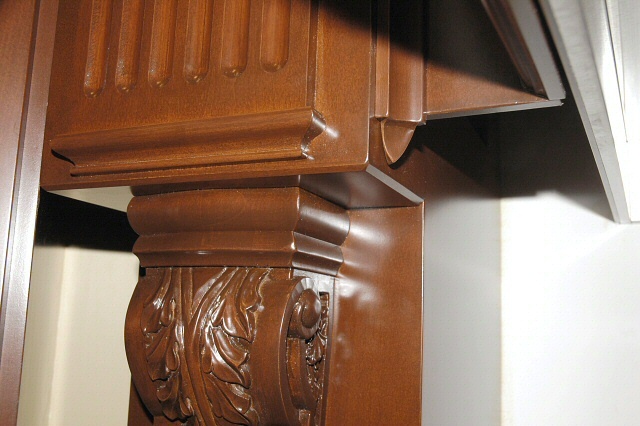 Two runs of molding were replaced with larger, more ornate moldings to create a more balanced look overall. 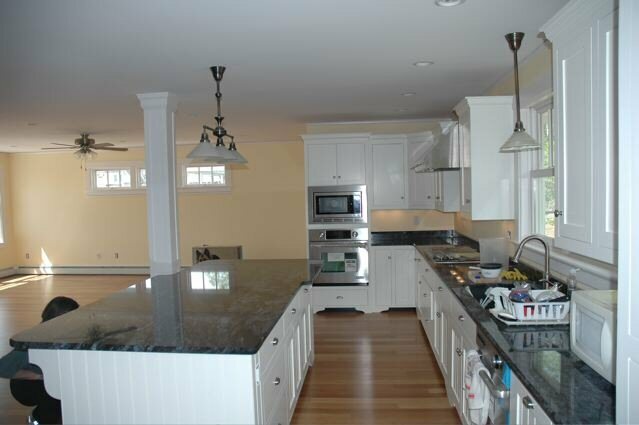 This kitchen resides in Longmeadow, MA. 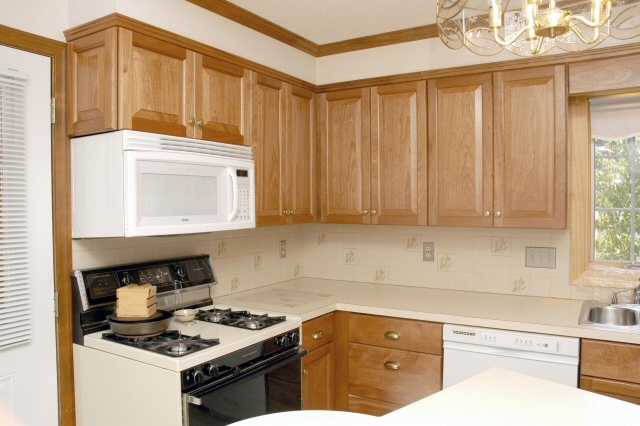 This is a painted kitchen done in a beaded panel style. The doors and cabinet sides have beaded panels. The doors swing on European concealed hinges and the dovetailed drawers ride on undermount self closing slides. 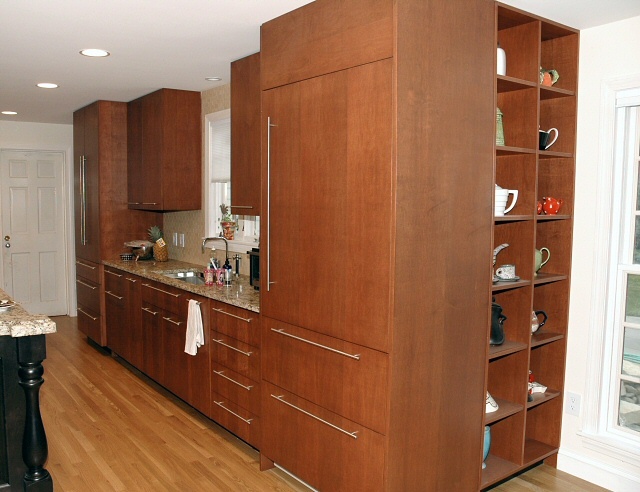 The pantry cabinet has roll out shelving on the lower section and adjustable shelving on the upper section. 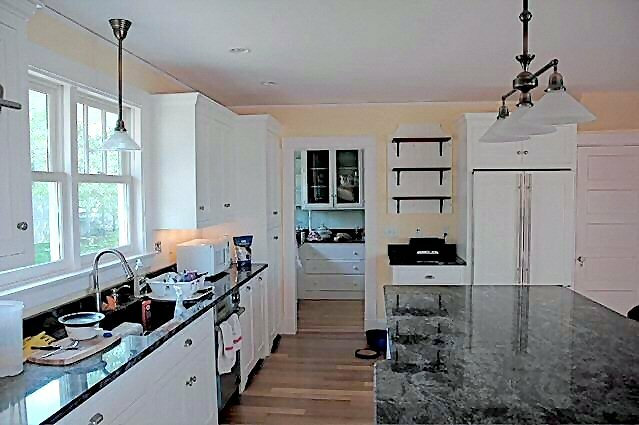 The island has sliding glass doors that were actual windows from the house. 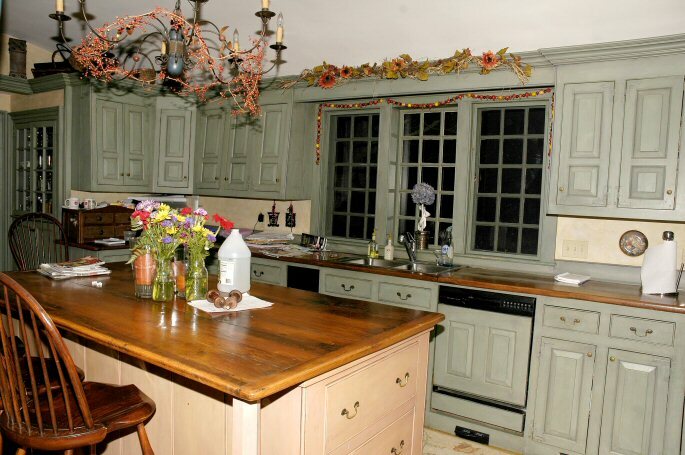 The open shelving near the refrigerator was made from wood reclaimed from the home owners boat. 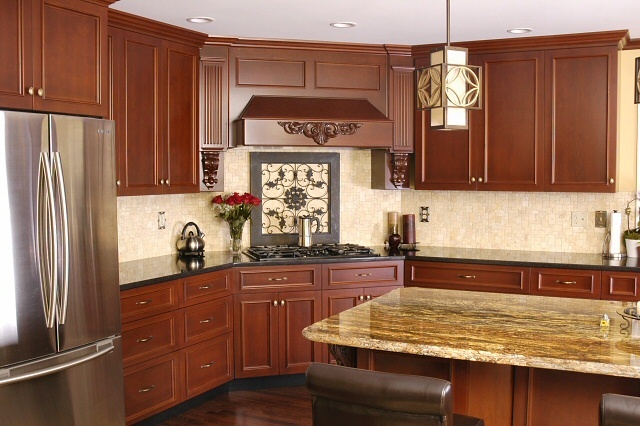 The columns were wrapped in the same beaded detailing as the cabinetry. 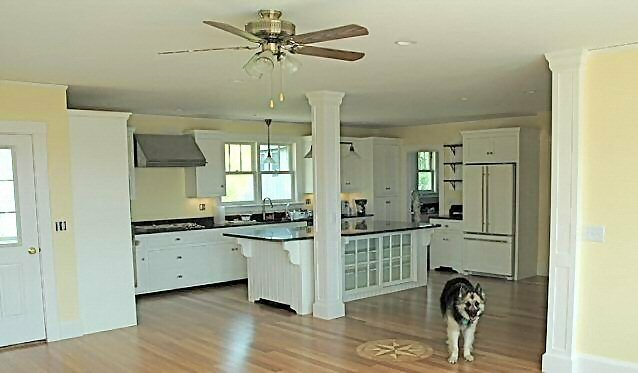 This kitchen resides in Norwich, CT.
doors. The Soft Maple is stained a translucent black that hides most of the grain letting it appear in the right lighting. 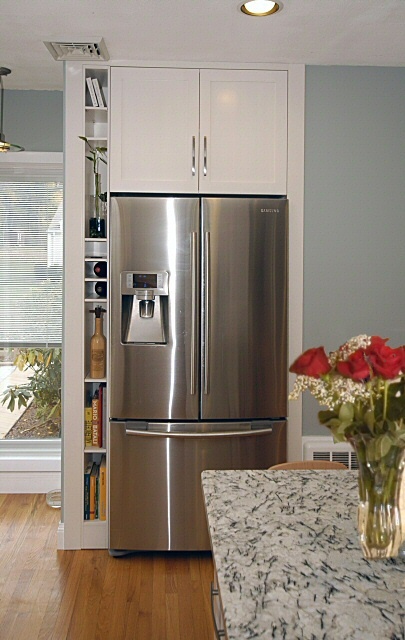 ice machine are hidden behind raised panel doors and the upper liquor cabinet is protected by hidden magnetic locks. 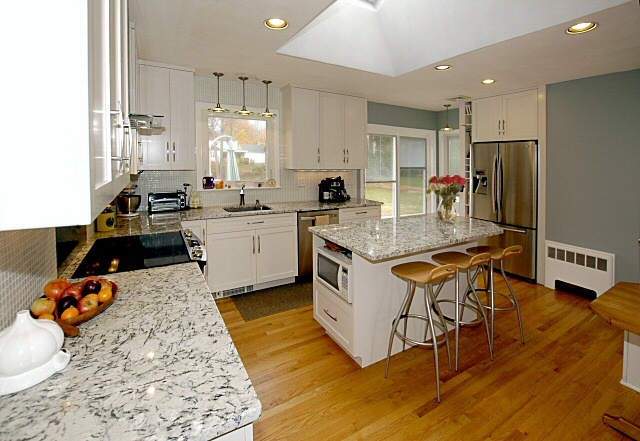 This kitchen resides in West Hartford, Ct.